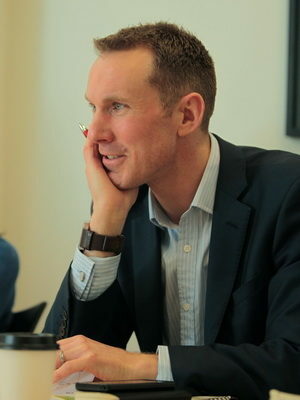 As part of the teaching team Andy Pearce works on all of the Centre's CPD programmes, and as a member of the research team he is involved in the Centre's academic activities. He is one of the lead authors of our national research into students' knowledge and understanding and is engaged in various scholarly projects. Andy has worked in Holocaust education for nearly a decade, having previously taught History and Politics in London secondary schools and completed doctoral research at Royal Holloway's Holocaust Research Centre. He has been involved in various projects with major institutions: he authored The Wiener Library’s travelling exhibition Never Again? Thinking About the Holocaust, and collaborated with the Imperial War Museum on their Moscati Collection. He has also worked with various media organisations - being commissioned by the BBC to write the iWonder guide 'Remembering genocide: Are we doing it right? ', and appearing on Sky News. Andy's outreach work has seen him provide consultancy for the UK delegation to the International Holocaust Remembrance Alliance (IHRA) and the Prime Minister's Holocaust Commission. Andy writes on issues related to Holocaust memory, Holocaust education, memory studies, teaching and learning, and contemporary history. His seminal book Holocaust Consciousness in Contemporary Britain provides the most comprehensive and up-to-date history of Holocaust memory in Britain; his new book, an edited collection entitled Remembering the Holocaust in Educational Settings, explores how teaching, learning, and remembering the Holocaust interact and interface; and he is co-editing with Professor Tom Lawson The Palgrave Handbook on Britain and the Holocaust (Palgrave, 2020). Andy continues to develop teaching and learning material. His most recent resource, 'A space called "Treblinka": The chaos of genocide & evolution of the Holocaust', draws on our landmark student research to address key issues around student knowledge and understanding. Specifically, 'A Space Called "Treblinka"' aims at developing knowledge and understanding of the death camp, expanding students' spatial and temporal frameworks, and inculcating new ways of looking at the Holocaust. Pearce, A. & Lawson, T. (eds. ), The Palgrave Handbook on Britain and the Holocaust (Basingstoke: Palgrave Macmillan, 2020) (In preparation). Pearce, A. 'In The Thick of It: Holocaust politics in Millennial Britain', Patterns of Prejudice, 2019 (In preparation). Pearce, A. 'Holocaust Education in Australian Universities: Reflections on a Roundtable', Australian Humanities Review, 63 (November, 2018). Pearce, A. 'Education, remembrance and the Holocaust: Towards pedagogic memory-work' in Remembering the Holocaust in Educational Settings, ed. Andy Pearce (London: Routledge, 2018). Pearce, A. 'The Anatomy of a relationship: the Holocaust, genocide, and education in Britain' in Remembering the Holocaust in Educational Settings, ed. Andy Pearce (London: Routledge, 2018). Pearce, A. (ed.) Remembering the Holocaust in Educational Settings (London: Routledge, 2018) (Forthcoming). Pearce, A. & Chapman, A. (eds.) Holocaust Education 25 Years On: Challenges, Issues, Opportunities (London: Routledge, 2018). Pearce, A. 'The Holocaust in the National Curriculum after 25 Years', Special Issue, Holocaust Studies: A Journal of Culture and History, 23:3 (2017). Pearce, A. & Chapman, A. 'Holocaust education 25 Years On: Challenges, Issues, Opportunities', Special Issue, Holocaust Studies: A Journal of Culture and History, 23:3 (2017). Pearce, A. 'Review: British POWs and the Holocaust: Witnessing Nazi Atrocities', Holocaust Studies: A Journal of Culture and History, Published online 2017. Pearce, A. Holocaust Consciousness in Contemporary Britain (London & New York: Routledge, 2014). Pearce, A. ‘Britain and the Formation of Contemporary Holocaust Consciousness: A Product of Europeanization, or Exercise in Triangulation?’ in The Transcultural Turn: Interrogating Memory Between and Beyond Borders, eds. Lucy Bond & Jessica Rapson (Berlin: Walter de Gruyter, 2014). Pearce, A. ‘Britain’s Holocaust Memorial Day: Inculcating “British” or “European” Holocaust Consciousness?’ in Britain and the Holocaust: Remembering and Representing War & Genocide, eds. Olaf Jensen & Caroline Sharples (Basingstoke: Palgrave Macmillan, 2013). Pearce, A. and Burgess, A. ‘Reflections on the “Lessons from Auschwitz” Project: Pedagogy, Responses & Challenges’ in Les Eleves Face a la Shoah: Lieux, Histoire, Voyages, eds. Jacques et Ygal Fijalkow (Presses du Centre Universitaire Jean-François Champollion : 2012). Pearce, A. ‘Review: The Lasting War & Philosophical Witnessing’, Journal of Contemporary History, 45:4 (2010). Pearce, A. ‘The Development of Holocaust Consciousness in Contemporary Britain’, Holocaust Studies: A Journal of Culture and History, 14:2 (2008). Pearce, A. and Lenga, R. 'The story of an Englishman in Auschwitz', The Conversation, 26 January, 2017. Pearce, A. 'Encounters and possibilities: Teaching and learning about the Holocaust', Royal Wootton Bassett Academy Holocaust and Genocide Programme Blog, 21 June 2016. Pearce, A. 'Remembering Belsen: do we know what we are forgetting? ', UCL IOE Blog, 18 April 2016. Pearce, A. 'When the National Curriculum is not compulsory', UCL IOE Blog, 3 July 2014.